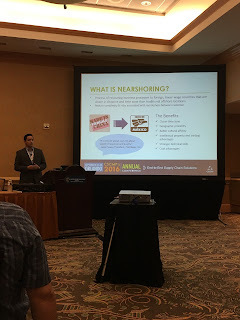 Home Events Nearshoring Source One News Exciting Day 2 at CSCMP2016! The success of this year’s Council of Supply Chain Management Professionals’ Annual Conference kickoff propelled a great second day of activities. Events on the agenda included recognition of The SmartWay Excellence Award recipients, induction of members into The Supply Chain Hall of Fame, and Source One’s presentation on Sourcing from Mexico: The Supplier Development Challenge. The US Environmental Protection Agency’s SmartWay Program was created in 2004 to promote energy efficient transportation in supply chains. With the EPA’s assistance, companies can identify more sustainable operational strategies. The SmartWay Excellence Award formally honors program partners committed to decreasing the impact of climate change and air pollution in supply chain processes. This year’s nine recipients are Bacardi, Home Depot, HP, Johnson & Johnson, Kimberly-Clark, Lowe’s, Transportation Insight, Union Pacific Transportation Services, and Whirlpool. A welcomed addition to the CSCMP annual event was the formation of the Supply Chain Hall of Fame. Created to recognize those who have made a lasting impact on the supply chain discipline. The first inductees distinguishes for their innovation were J.B. Hunt, Henry Ford, and Malcolm McLean, the shipping and trade revolutionary. A highlight of the day was Source One’s Diego De La Garza and his presentation on Nearshoring. Addressing the conference as a featured speaker, De La Garza shared his experience with assisting companies relocate their supply chain operations from Asian counties to Mexico. The talk also includes the discussion of factors that influence this nearshoring trend as well as the obstacles that often arise once a company has committed to moving their operations. Diego De La Garza was excited to address the CSCMP Annual Conference attendees so that he could share Source One’s dedication to finding innovative supply chain solutions.